Looking for a venue that has all the rustic charm of a working farm but is only a few minutes’ drive from downtown? Perched high on the fifth floor of downtown Portland’s Yard tower is luxe spa and social club newcomer Knot Springs. 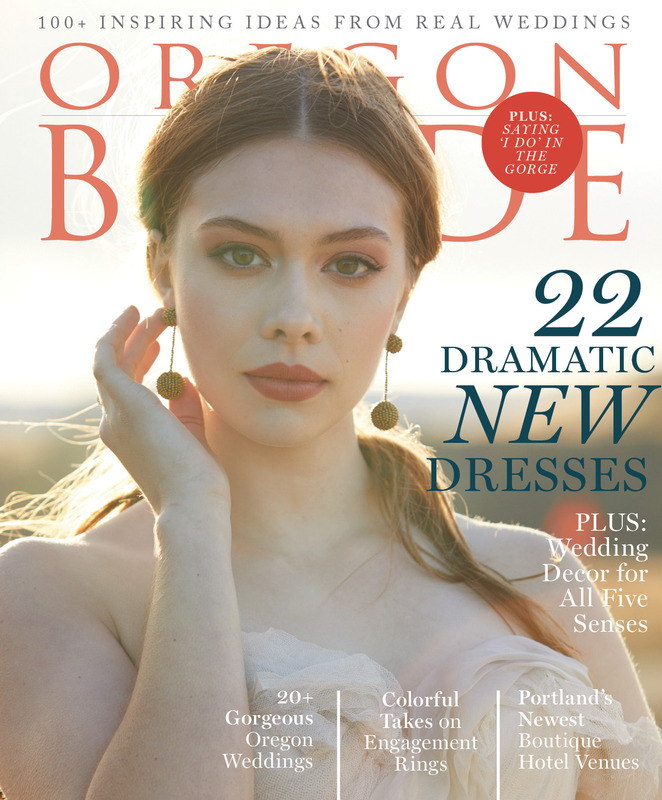 Inside the lush, leafy walls of Portland’s Leach Botanical Garden, stylists Jena Ralls and Alex Sand, co-owners of the recently launched Portland wedding styling and planning company The Real Creative, set a scene with the modern bohemian bride in mind. “After over a year of planning for their picturesque Oregon wedding, Sadie and Korey woke up to just that: an Oregon wedding. A day that consisted of pouring rain, with absolutely no breaks,” says the couple’s photographer, Monique Serra. With black, white and silver as their colors, the couple went for all-out glam with candlelit floral centerpieces dripping with crystal garlands and dramatic lighting that featured their new shared initial shining on the walls of the historic Sentinel. “Aaron and I really wanted our wedding to be an example of who we are; from homemade (literally made in our home) bottled cocktails as wedding favors to lawn games and a late-night dance party,” says Courtney. The pair dreamed up a photo shoot seen on the opening page that blended elegance with the boho trend that remains popular. “Including children at weddings can be so lovely, but long periods of sitting still can be difficult for kids—and their parents,” says Nora Sheils, owner of Bridal Bliss. “My friend [designer] Elizabeth Dye gave me some great advice. She said don’t over-plan your reception,” says December. “My family brought leis from Hawaii for everyone in the wedding party to wear, bringing some Aloha spirit to snowy Oregon,” says Chris. “I had always wanted a fall wedding, and Laurelhurst Club was the perfect location for that,” says Jamie. “We went DIY on almost everything, which made planning the wedding quite a bit more exciting than usual!" “Our wedding day was perfect because neither of us worried about the small stuff too much,” says Sabrina. “Being from opposite sides of the country—New Hampshire and Idaho—we knew from the start that our priorities were to have a space where we could have a couple days all spending time together and celebrating,” says Lindsay-Lee. “I was inspired by the start of fall season, and the existing beauty of Hotel Vintage and downtown Portland,” says Sierra. “I wanted everything we chose to play off to those things." With her family’s sweeping 532-acre vineyard in Oregon wine country as their backdrop, Tahmiene and Colin didn’t have much to do in terms of wedding decoration.